Manuscript notebook of the wife of Edward Augustus Freeman. c.1850-1931. 96pp + many further handwritten loose recipes inserted, a few printed newspaper cuttings etc. Disbound, worn notebook in box. 22cm x 17cm x 3cm. The notebook is undated, but is of an earlier date than the inserted recipes. The notebook is that of Eleanor Freeman, with the inserted additions collected and added by her daughter, Katharine Scott-Holmes.Recipes collected in a few different hands. Reflecting the time of war, several of the inserted recipes are written on mourning cards/paper. 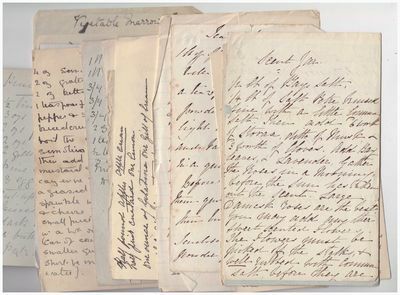 A few are written on re-used envelopes (stamped and addressed to Katharine Scott-Holmes).A snapshot into domestic life at the houses of Somerleaze and East Liberty, Wells from the mid-nineteenth to early twentieth centuries, and reflecting periods of war. With additional handwritten recipes inserted from:Angela Murnaghan, Lisanelly Omagh Co Tyrone, wife of George Murnaghan MP. (1847-1929); Dame Augusta Jane Wells, Cheltenham; Penelope Poole Richmond Cottage, Uley, Dursley, Glos. ; Margaret Lane-Fox, 2 Rodney Place, Clifton, wife of Patrick Watson-Williams (1863-1938), and mother of Paule Vézelay (1892-1984); and others.Eleanor Freeman (1818-1903) nee Gutch, daughter of Robert (tutor to E.A. Freeman) and Mary Ann Gutch of Seagrave. "a most estimable young lady" married Edward Augustus Freeman in 1847. Mother of Katharine, and Margaret, who married Sir Arthur John Evans, Archaeologist. Edward Augustus Freeman (1823-1892), prolific writer. Historian, liberal politician, Regius Professor of Modern History at Oxford, where he tutored Arthur Evans with whom he was actively involved in the Balkan uprising of Bosnia and Herzogovina 1874-1878. Politically involved in the emerging Greek Kingdom, he received the KC of the Order of the Saviour by the King of Greece, and was similarly decorated by the Prince of Montenegro. The family settled at Somerleaze, Wells in 1860. Katharine Scott-Holmes (1854-1948) daughter of Eleanor and Edward Freeman, wife of Rev. Thomas Scott-Holmes (1852-1918) Author of History of the Parish of Wookey; Glastonbury Costumaria; Historical and Legendary Glastonbury; History of Wells and Glastonbury; etc., etc. of East Liberty, Wells, Somerset.